An unguided transmission transmits the electromagnetic waves without using any physical medium. Therefore it is also known as wireless transmission. In unguided media, air is the media through which the electromagnetic energy can flow easily. Radio waves are the electromagnetic waves that are transmitted in all the directions of free space. Radio waves are omnidirectional, i.e., the signals are propagated in all the directions. The range in frequencies of radio waves is from 3Khz to 1 khz. In the case of radio waves, the sending and receiving antenna are not aligned, i.e., the wave sent by the sending antenna can be received by any receiving antenna. An example of the radio wave is FM radio. A Radio wave is useful for multicasting when there is one sender and many receivers. An FM radio, television, cordless phones are examples of a radio wave. Radio transmission is mainly used for wide area networks and mobile cellular phones. Radio waves cover a large area, and they can penetrate the walls. Radio transmission provides a higher transmission rate. Terrestrial Microwave transmission is a technology that transmits the focused beam of a radio signal from one ground-based microwave transmission antenna to another. Microwaves are the electromagnetic waves having the frequency in the range from 1GHz to 1000 GHz. Microwaves are unidirectional as the sending and receiving antenna is to be aligned, i.e., the waves sent by the sending antenna are narrowly focussed. In this case, antennas are mounted on the towers to send a beam to another antenna which is km away. It works on the line of sight transmission, i.e., the antennas mounted on the towers are the direct sight of each other. Frequency range: The frequency range of terrestrial microwave is from 4-6 GHz to 21-23 GHz. Bandwidth: It supports the bandwidth from 1 to 10 Mbps. Short distance: It is inexpensive for short distance. Long distance: It is expensive as it requires a higher tower for a longer distance. Attenuation: Attenuation means loss of signal. It is affected by environmental conditions and antenna size. Microwave transmission is cheaper than using cables. It is free from land acquisition as it does not require any land for the installation of cables. Microwave transmission provides an easy communication in terrains as the installation of cable in terrain is quite a difficult task. Communication over oceans can be achieved by using microwave transmission. Eavesdropping: An eavesdropping creates insecure communication. Any malicious user can catch the signal in the air by using its own antenna. Out of phase signal: A signal can be moved out of phase by using microwave transmission. 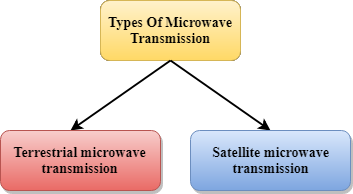 Susceptible to weather condition: A microwave transmission is susceptible to weather condition. This means that any environmental change such as rain, wind can distort the signal. Bandwidth limited: Allocation of bandwidth is limited in the case of microwave transmission. A satellite is a physical object that revolves around the earth at a known height. Satellite communication is more reliable nowadays as it offers more flexibility than cable and fibre optic systems. We can communicate with any point on the globe by using satellite communication. The satellite accepts the signal that is transmitted from the earth station, and it amplifies the signal. The amplified signal is retransmitted to another earth station. The coverage area of a satellite microwave is more than the terrestrial microwave. The transmission cost of the satellite is independent of the distance from the centre of the coverage area. Satellite communication is used in mobile and wireless communication applications. It is used in a wide variety of applications such as weather forecasting, radio/TV signal broadcasting, mobile communication, etc. Satellite designing and development requires more time and higher cost. The Satellite needs to be monitored and controlled on regular periods so that it remains in orbit. The life of the satellite is about 12-15 years. Due to this reason, another launch of the satellite has to be planned before it becomes non-functional. An infrared transmission is a wireless technology used for communication over short ranges. The frequency of the infrared in the range from 300 GHz to 400 THz. It is used for short-range communication such as data transfer between two cell phones, TV remote operation, data transfer between a computer and cell phone resides in the same closed area. It supports high bandwidth, and hence the data rate will be very high. Infrared waves cannot penetrate the walls. Therefore, the infrared communication in one room cannot be interrupted by the nearby rooms. An infrared communication provides better security with minimum interference. Infrared communication is unreliable outside the building because the sun rays will interfere with the infrared waves.